Fantasy Football: Running Back Start/Sit Rankings (Week 6) - Fantasy Football, Fantasy Football Rankings | Mac Bros. 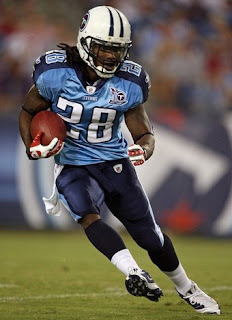 Here they are—Fantasy Football Running Back Rankings for Week 6 (2010) to help you decide who to start and who to sit on your fantasy football team. 2. Frank Gore (SF) - He had his issues in week 5, but a promising week 6 match up against Oakland should more than make up for it. The Raiders are giving up close to 150 rushing yards per game on average to go along with 6 rushing scores allowed. Gore should have a field day against this defense. 3. Adrian Peterson (MIN) - He will face a Cowboys defense in week 6 that is no cupcake, but as Chris Johnson proved in week 5, Dallas can be vulnerable against the league’s better RBs and Peterson certainly falls into that category. Peterson is a must start fantasy option as usual. 4. Michael Turner (ATL) - If week 5 was any indication, Turner’s groin injury is no longer an issue and “The Burner” should keep it rolling into a favorable week 6 match up against Philadelphia. The Eagles have been one of the NFL’s more generous defenses with regard to opposing RBs so far this season. They rank just 24th in the NFL against the run and have allowed 4 TDs on the ground in 5 games. 5. Rashard Mendenhall (PIT) - He doesn’t have the greatest track record against the Browns and much to everyone’s amazement, Cleveland is the only team in the NFL that has yet to allow a rushing TD. That said, we fully expect all of the above to change in week 6 and the Browns are still plenty generous in the yards allowed category ranking 23rd. In fact, the similar Michael Turner lit Cleveland up for 140 rushing yards on just 19 carries in week 5. 7. Ahmad Bradshaw (NYG) - According to Bradshaw, his ankle is no longer an issue and that is certainly music to the ears of fantasy owners heading into week 6 against Detroit. At full speed, Bradshaw should dominate a generous Lions defense that has already given up 871 total yards and 7 TDs to opposing RBs through 5 games. 11. LaDainian Tomlinson (NYJ) - Considering the difficulty of his week 5 match up against Minnesota, Tomlinson’s 107 total yards on a rain soaked field was impressive. Chances are he will fare even better in week 6 against an injury plagued Denver defense that allowed 233 rushing yards and 4 rushing TDs against Baltimore in week 5. Tomlinson’s only downside is his ongoing timeshare with Shonn Greene. 12. Steven Jackson (STL) - He isn’t a TD machine, but if you are looking for consistent double figure fantasy totals, Jackson is your man. We expect more of the same in week 6 against San Diego. The Chargers have been very good against the run for the most part this season, but they did allow Michael Bush to run up 135 total yards and a TD against them just last week. Jackson is plenty capable of matching or exceeding Bush’s totals, but it won’t be easy. 13. Ryan Torain (WAS) - He hasn’t wowed anyone since taking over as the feature back for the Skins, but there is a good chance that could change in week 6. Torain will face a Colts run defense that currently ranks just 29th in the NFL. On average, the Indianapolis defense is giving up 142 rushing yards and a TD per game to opposing running attacks. He is a bit of a sleeper pick based on his performance so far, but his chances for success against this defense easily qualify him for high end RB2 or flex status in our opinion. 14. Michael Bush (OAK) - Rushing for over 100 yards and a TD against a very solid San Diego run defense is no easy task and Bush did just that in week 5. In week 6, he will face a 49ers defense that ranks middle of the pack in the NFL in stopping the run and dead last in receiving yards allowed versus running backs. Bush will likely serve you well in both areas, but it will not be a cakewalk against a fired up Niners defense in San Francisco. Side note: There is a chance Darren McFadden will return from injury this week, but even if he does, it will be in a very limited capacity and Bush will carry most, if not all of the load. 15. Jamaal Charles (KC) - He seems to be inching closer every week to regaining his feature role and that will serve fantasy owners well. Charles will be facing the Texans in week 6. While Houston has been fairly stingy in the yardage department against the run ranking 5th in the NFL, they have allowed 5 rushing TDs in 5 games and only 8 teams have given up more fantasy points to opposing RBs so far this season which bodes well for the explosive Charles. 16. Matt Forte (CHI) - It seems we completely underestimated Forte in week 5, but seeing as he hadn’t rushed for more than 50 yards in a game previously; we seriously doubt anyone expected him to blow up against a Carolina defense that had been pretty good against the run to that point. Regardless, it was a promising step in the right direction and Forte will need all the momentum he can get for a tough week 6 match up against a Seattle run defense that ranks 2nd in the NFL. The Seahawks have allowed just 291 ground yards and 2 rushing TDs in 4 games this season. Opposing RBs are averaging just 2.7 yards per carry against them, so Forte will need to be very handy in the passing game to have success in week 6. 20. Ronnie Brown (MIA) - Brown hasn’t given fantasy owners much to be excited about so far this season.. However, there are some favorable aspects to Brown’s week 6 match up against Green Bay. For starters, Dolphin’s Coach Tony Sparano indicated earlier this week that they needed to get back to running the ball more often which is promising. More importantly, the Packers line backing corps and driving force against the run has been decimated by injuries of late which also bodes well for Brown. If Sparano holds true to his word and Brown gets a nice bump in carries this week, it should result in a nice fantasy day, but don’t bet the farm on it.